We introduce daily themes and activities and offer three different weeks of programming on an alternating schedule. Seymour Survival Camp will teach participants the basics of survival, including learning edible plants, building shelters, bear hangs, compass navigation, signalling and much more. On Friday, the groups will be put into a scenario and will need their skills to complete the task at hand.... survive. A new camp for summer 2019! Ever wondered why it’s called Mystery Lake or Mystery Peak? Mt Seymour has lots of unsolved puzzles, that will challenge campers to think outside of the box and get out there to explore our beautiful mountain terrain. Will our campers solve all of the mysteries and crack the codes before this weeklong camp ends? Our Junior Ecologist Camp encourages inquisitive minds to gain a deeper understanding of the natural environment. Looking at the tiniest mountain critters to the largest rock formations found in the park campers will come away with a much deeper understanding and greater connection with our beautiful back yard! Mt Seymour Eco Adventure camps is proud to be partnering with Ocean Ambassadors Canada on what is set to be the best week of your child’s summer! This eco conscious combo camp really is the sea to sky experience. Campers time is split between ocean and mountain top, exploring the shoreline and tidal ecosystems on paddleboards with Ocean Ambassadors Canada. 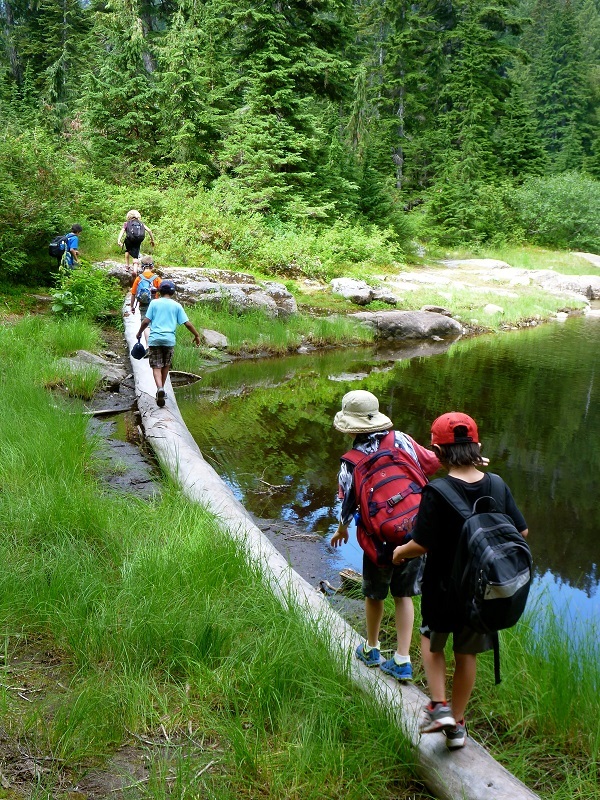 On Mt Seymour campers will participate in our Junior Naturalist program getting to know the mountain ecosystem through exploration and play. Age Group 8-9 will spend 3 fun filled days up on Mt Seymour and 2 days with Ocean Ambasadors Canada exploring our costal waters. Age Group 10-12 Will spend 3 days exploring our costal waters with Ocean Ambasadors Canada and 2 days on Mt Seymour getting to know the moutains beautiful ecosystems. This camp is only available for children ages 8 – 12. Spaces are extremely limited book early to avoid disappointment. No lunch option is available with this camp. Transport is included to and from camp at Parkgate community center. How do the activities differ between age groups? The Trailblazers explore the mountain through games and structured free play. This age group might not travel quite as far as their older counterparts, but they have just as much fun! Trailblazers spend their days singing songs, listening to stories and recording all of the mountain sights and sounds in their journals (or, as we like to call them, Adventure Logs!). Your camper will learn a great deal about wildlife through educationally framed games and most likely build an awesome debris shelter “fort”. We also recognize that with little ones every day is a unique experience, so activities are dictated by whatever is going to keep Trailblazers smiling and coming home with awesome stories to share. This age group explores the mountain’s closer network of Discovery trails and often climbs the short, but awesome, Dinkey Peak. We trust our instructors, and based on several years of feedback about the 5-7 year old age group, this year we have adjusted it so participants must be 5 by Dec 31st, 2018. This means, they will be a minimum of 5 years and 6 months by camp time. Experience has shown that these 6 extra months, and having a year of school complete, make for a much better experience in camp for them and the rest of their group. This means everything to us, so we apologize for the inconvenience and let down this change may bring but believe it's for the best. Being our middle age bracket, the Forest Guardians are given the opportunity to learn and explore at a level not suited to the Trailblazers, but not quite as intense as the Mountain Rangers. We aim to teach your camper to revere and respect the living world around them through games and discovery. At every turn we provide opportunities to practice newly learned skills such as how to use a compass or how to hang food safely from bears. A perennial favourite with this group is the hike to Mystery Lake, where “pondology” and the hunt for cool aquatic insects can last for hours. The Mountain Rangers go on longer treks than both the Trailblazers and Forest Guardians. We try to mix hard skills like plant ID and shelter building with age appropriate games like Capture the Flag that are sure to keep your child engaged and entertained in outdoor learning. Depending on the interests of the group they might also learn knots and go much more in depth into navigation. Typical longer days for this age group include Dog Mountain, the North Shore Search and Rescue Cabin and (occasionally) even First Pump Peak! Every day is different on the mountain, and we train our instructors on a ton of games, actitivies and skills to make each day fun, adjustable and engaging for every group. Here is some more of what you may hear about from the kids!